, an ancient Roman historian, who flourished in the reign of Tiberius Caesar, was born in the year of Rome 735. His ancestors were illustrious for their merit and their offices. His grandfather espoused the party of Tiberius Nero, the emperor’s father; but being old and infirm, and not able to accompany Nero when he retired from Naples, he ran himself through with his sword. His father was a soldier of rank, and Paterculus was a military tribune, when Caius Caesar, a grandson of Augustus, had an interview with the king of the Parthians, in an island of the river Euphrates, in the year 753. He commanded the cavalry in Germany under Tiberius, and accompanied that prince for nine years successively in all his expeditions. He received honourable rewards from him but we do not find that he was preferred to any higher dignity than the proctorship. 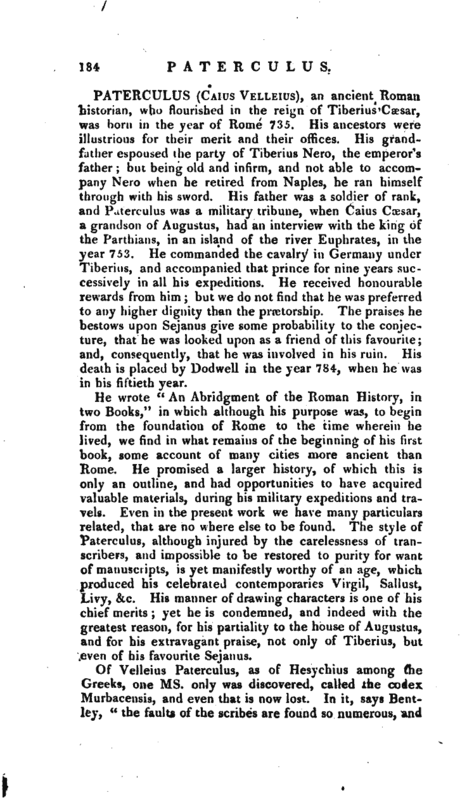 The praises he bestows upon Sejanus give some probability to the conjecture, that he was looked upon as a friend of this favourite; and, consequently, that he was involved in his ruin. His death is placed by Dodwell in the year 784, when he was in his fiftieth year. He wrote “An Abridgment of the Roman History, in two Books,” in which although his purpose was, to begin from the foundation of Rome to the time wherein he lived, we find in what remains of the beginning of his first book, some account of many cities more ancient than Rome. He promised a larger history, of which this is only an outline, and had opportunities to have acquired valuable materials, during his military expeditions and travels. Even in the present work we have many particulars related, that are 09 where else to be found. 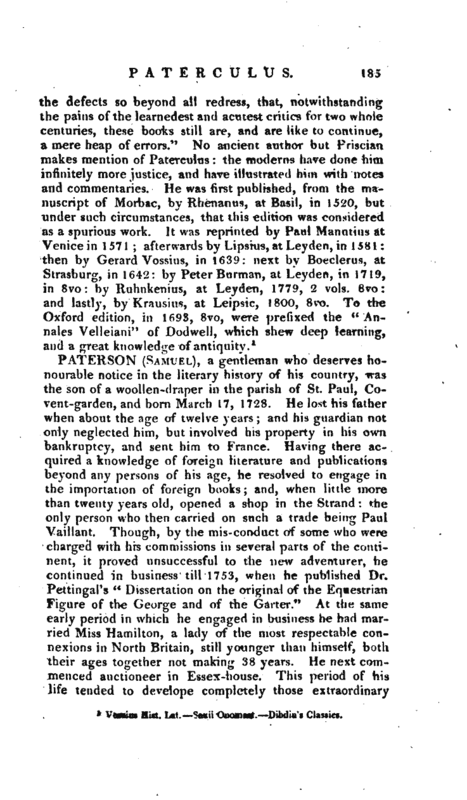 The style of Paterculus, although injured by the carelessness of transcribers, and impossible to be restored to purity for want of manuscripts, is yet manifestly worthy of an age, whicli produced his celebrated contemporaries Virgil, Sallust, Livy, &c. His manner of drawing characters is one of his chief merits; yet he is condemned, and indeed with the greatest reason, for his partiality to the house of Augustus, and for his extravagant praise, not only of Tiberius, but even of his favourite Sejanus. 1 Vossius iiisf. Lat. Saxii Qnoma$t. Dibdin’s Classics.